Teysachaux (1,909 m) is a mountain of the Swiss Prealps, overlooking Les Paccots in the canton of Fribourg. In patois, Teysachaux is the contraction of taiza ("spread") and chaux ("meadow"). View of Teysachaux from the summit of Dent de Lys. Teysachaux lies at the south end of the Moléson ridge, west of the Sarine river valley. Nearby summits include Niremont on the west side and Dent de Lys on the south side. Several chalets (some of them have been converted into small restaurants) can be found on Teysachaux's slopes. They have been built during the 18th and 19th century, showing the evidence of a progressive expansion of farming (mainly milk and cheese) towards higher meadows. 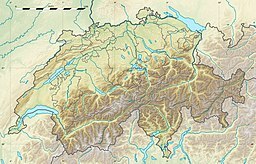 ^ "Noms de lieux de Suisse romande, Savoie et environs (in French)". OFEV. Retrieved 10 December 2014. ^ "Musée d'Histoire Naturelle de Fribourg (in French)". OFEV. Retrieved 10 December 2014. This page was last edited on 17 June 2018, at 22:11 (UTC).